Nothing makes you realize how much or how little you drive like spending time with an electric vehicle. The mere thought of EVs brings up phrases like "range anxiety," and thoughts about how someone could never own an EV because they only get 80 miles on a charge. And while a purely electric vehicle might not work for everyone in every place, they do work very well as commuters in certain places. For example, I drive about 22-25 miles a day. It rarely gets colder than the upper 20s and seldom hotter than the upper 80s here in Portland, so battery life is quite predictable. We own three gas-powered vehicles, so it would be very easy for us to ditch one of them (sorry Toyota Yaris, you'd be the one to go), and go completely electric. I will say between Mercedes and me, we've driven nearly all of the electric vehicles on the market (sans the Tesla Model S), and both agreed the Spark EV could find its way into our driveway some day. 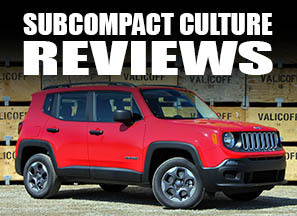 It's the right size, fun to drive, practical, and we like the looks. This wasn't the first time I've spent time with the Spark EV. Last time was at the vehicle's launch, which just so happened to take place in Portland, too. I got to spend the day with the subcompact EV and immediately developed a fondness for it, much of which comes from the fact that it's tiny and has 400 ft/lbs of torque. I was really looking forward to driving it for a week. Fast forward to now, and I must say, I'm still very fond of this EV. 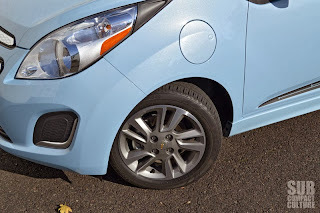 The Spark EV isn't a reinvention of the wheel. 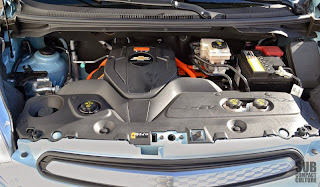 It's a Chevrolet Spark body and chassis with a lot of Chevrolet Volt know-how (sans range extending gas engine) installed in place of the tiny 1.2-liter four-banger found in gas versions. It has a range of 82 miles and easily darts in and out of traffic, down city streets, or frankly any other paved road you might happen to venture down. And by the way, with 400 ft/lbs of torque, the Spark EV is quite capable of rapidly darting around anywhere. The Spark EV is by far the most fun and powerful of the EVs out there, minus the much larger and more expensive Tesla Model S. You can easily lose traction at rolling speeds of 30 mph thanks to the abundance of power. 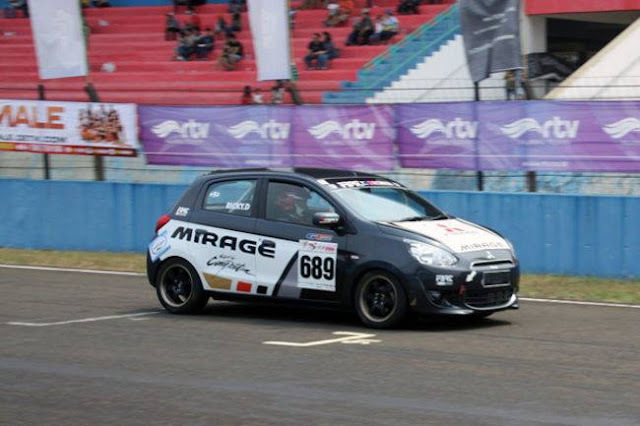 Don't worry, it has traction control. However, the acceleration isn't its only performance strong suit. The car has great steering feel and is quick to turn. While the low-rolling resistance tires don't do much for grip, the car handles confidently. Just don't push it too much on those narrow, hard tires. Predictably, the car is most at home in the city, where its quick reflexes shine. But its highway manners are better than expected. The ride is quite good; something you don't get out of city cars too often. There's plenty of power here, too. Punch it from 50 or 60 and it'll accelerate strongly—certainly stronger than the Smart Electric Drive we recently reviewed. If you're looking for an EV that's actually fun to drive (and can't afford a Tesla), this is the one you'll want. 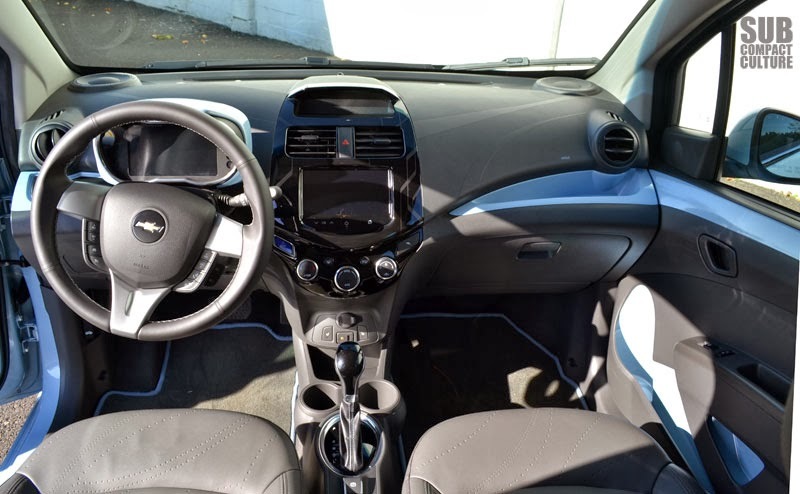 The Spark EV's interior is very similar to the gas version, although the display is totally different. It uses an LCD readout for all of the critical functions, such as speed, range, power delivery, etc. It's easy to read and effective. There is a wheel/button setup to the left of the gauge cluster that allows you to scroll through a host of sub-menus ranging from navigation to odometer functions. 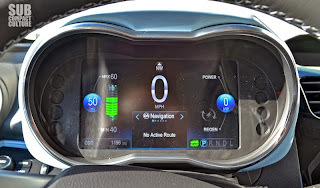 The infotainment system is a full-color touchscreen that handles everything including climate control (although there are a second set of climate controls below the screen), music, photos, navigation, and electricity information. Some of the electricity info includes a pie chart showing how your power has been used since your last charge. There are also timers for charging and several other informational menus. One thing that needs improvement is the stereo. With bargain-basement speakers and a lackluster sound, the audio quality is reminiscent of a Geo Metro rather than a 21st-century EV. However, that's easily fixable with a trip to a car stereo shop. I particularly like the interior's design. Neat shapes, modern flowing lines, and comfortable leatherette seats (with heaters in the front) adorn the cabin. Unfortunately many of the materials do feel inexpensive, such as the hard plastic dashboard. The 120V charging cord is located in the back, and sits under a flimsy feeling cover. In that same vein, the rigid cargo cover also feels chintzy as does the plastic that it rests on. The rear seats do fold down for additional cargo carrying ability; a feature I used when going to Costco. But the car's hatchback configuration easily made work of my small-to-medium-sized purchases. 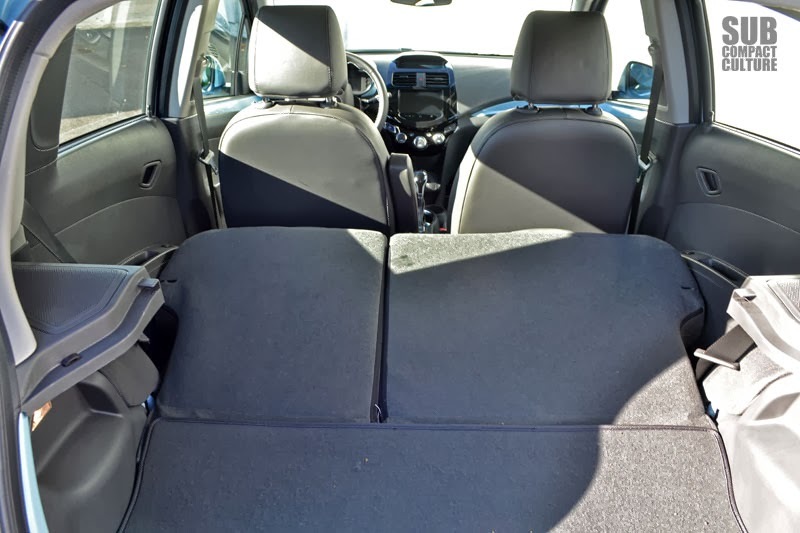 Speaking of the rear seats, they are a bit sung. Yes, you can get two adults in there, but they aren't the most comfortable quarters. As I mentioned, the car has an 82 mile range when fully charged. I only have a 120V outlet I can use, so I'd simply plug the car in around 5:00pm when I got home from work, and unplug it when I left for work around 6:30am. While it generally takes 17 hours to totally charge the vehicle from dead to 100% full on 120V, my 13.5 hours was more than enough to drive my 22 mile round-trip journey to and from work. The Spark allows 120V charging and 240V charging. Unlike the Nissan Leaf, however, the Spark EV cannot use the current DC fast-charge stations that are sometimes found at businesses and such. At least not yet. 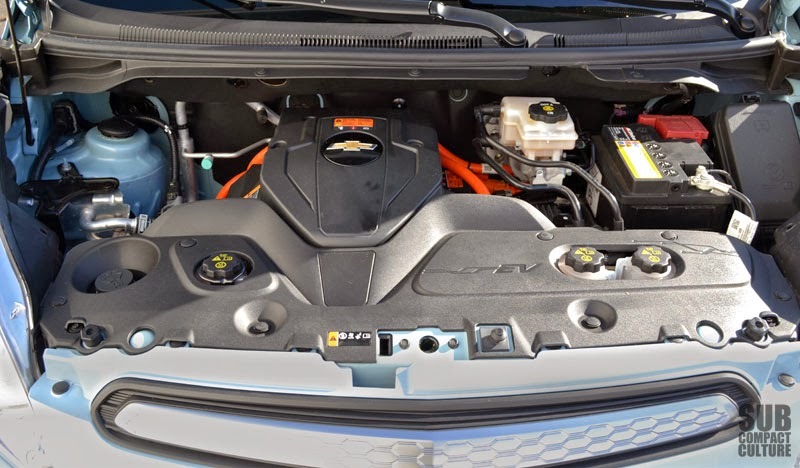 Chevrolet is promising it will have an option (which should be about $800) to allow for the use of the upcoming SAE-approved fast charger, which will charge 80 percent of the battery in 20 minutes. As of this time, this option is not yet available, however. For what it's worth, many major automakers including GM, Ford, Chrysler, BMW, Daimler, Volkswagen, Audi, and Porsche have announced they will adopt the SAE combo fast charge connector. 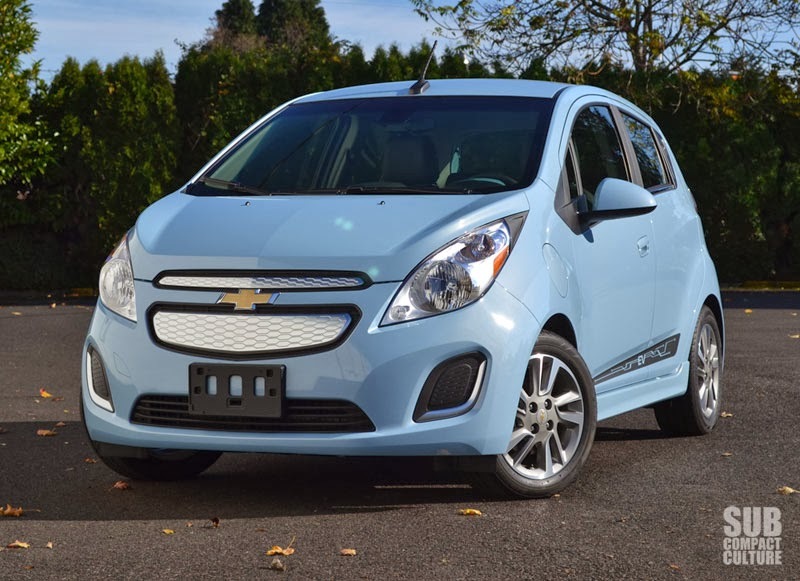 The as-tested price of our Spark EV is right around the $27,000 level. Of course, that's before the available $7,500 tax credit in Oregon, and before other available incentives in California. 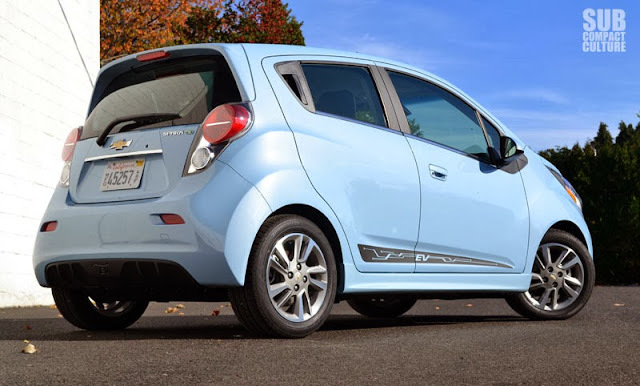 At the moment, the Spark EV is only for sale or lease in California and Oregon. Keep in mind, over 90% of EV users lease their vehicles, and Chevrolet does have a $199 lease for 36 months with $999 down at the moment. No, this car—or any EV for that matter—isn't for everyone. You can't cross the continent in one. You can't simply stop and refuel it in 10 minutes. However, it uses zero gas, and depending on the vehicle you own, can pay for itself. My co-worker just bought a Spark EV. He went from paying $350 a month in fuel on his Ford F-150, to a less-expensive Spark EV lease payment so he's actually coming out ahead. Regardless of price, the Spark EV is a lot of fun, no strings—or wires—attached.